In writing this for Gary, who is on holiday, I would like to bring some personal perspective into our relationship with the Burma Children Medical Fund's (BCMF) B.K. Kee Patient House. As some of you know, our relationship with the Mae Tao Clinic (MTC) in Mae Sot, Thailand began even before we were chartered as a Rotary club. Out of this association we became aware of BCMF, founded by Kanchana Thornton, who is Karen, and married to writer Phil Thornton. Phil authored the book Restless Souls: Rebels, Refugees, Medics and Misfits on the Thai-Burma Border. BCMF was established in 2006 in response to the increasing number of children living along the Thai-Burma border who required complex medical treatment and surgery that is not available at local clinics or hospitals. Prior to BCMF being established, children who required surgery had their symptoms treated and lived either severely incapacitated lives or died prematurely as a result. In addition to funding patients’ medical treatment and providing support services, BCMF also provides patients with food and accommodation for as long as they are undergoing treatment. Unfortunately, some patient conditions are not able to be treated in hospital facilities in Tak Province. These patients require transport to Chiang Mai for treatment at either the provincial Nakorn Ping hospital or, more typically, the Chiang Mai University hospital commonly called Suan Dok hospital. 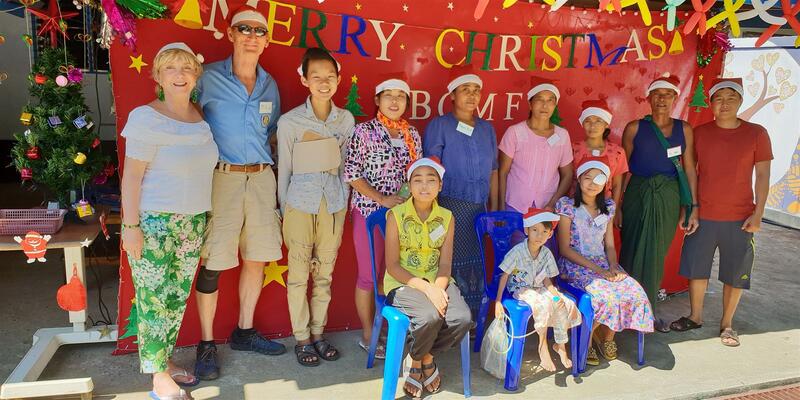 BCMF operates a safe house for the patients and their families in Chiang Mai, Thailand under the name B.K. Kee Patient House. 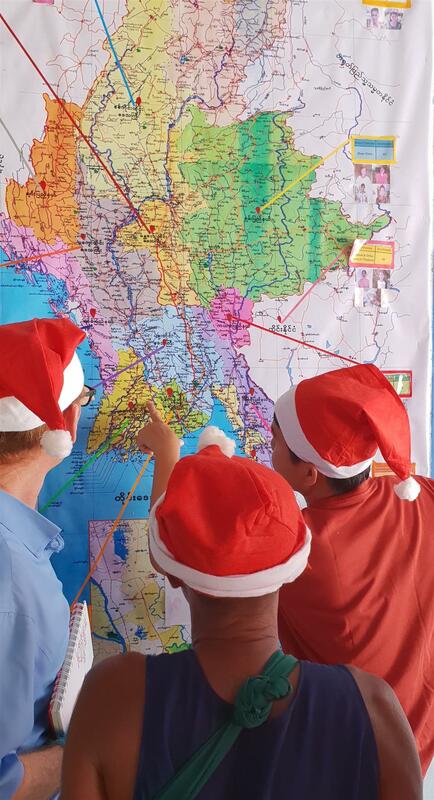 At right, patients show Rotarian Mike Lake the location of their hometowns. Typical conditions that require treatment in Chiang Mai and not available in Mae Sot/Tak are: cardiac disease or disorders, neurological conditions, obstetric/gynecological conditions, eye conditions and disorders, gastrointestinal conditions, blood disorders, urological conditions, orthopedic conditions, severe burns, congenital musculoskeletal deformities and abnormal growths/benign tumors. Some of our club members make weekly Sunday morning visits to the patients and their families at B.K. Kee Patient House. Some of our regular visitors are Mike Lake, Gary Herman, Roger Lindley and visiting Rotarian Gordana Nardini from Croatia when she makes her regular annual winter visits to Chiang Mai. Activities include but are not limited to: supplying basic toiletry items, fruit and vegetable donations, general English language dialogue, dealing with items in disrepair or would help with better operation of house, and some special event parties for the patients and their families. This month we celebrated the holiday season with a gift exchange and treats.